Coral reefs didn’t need more bad news. They’re already being cooked by climate change and mangled by fishing gear. But because this is the age of humans, they are also being poisoned by billions of bits of plastic. A new analysis estimates there are at least 11.1 billion pieces of plastic entangled on coral reefs across the Asia-Pacific region. Unsurprisingly, that’s taking a toll: the authors estimate the likelihood of disease rises from four to nearly 90 percent when corals come in contact with garbage. That’s a 20-fold increase in the risk of disease for corals ensnared in carry-out bags and bottle holders. The scientists, from Cornell University, the Australian Research Council Centre of Excellence for Coral Reef Studies at James Cook University, and elsewhere, surveyed 159 reefs from eight Asia-Pacific regions between 2011 and 2014, including reefs off the coast of Myanmar, Thailand, Indonesia, and Australia. 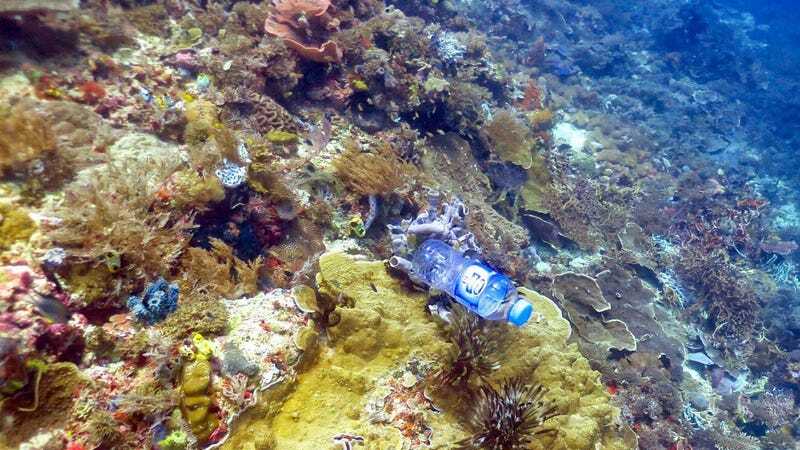 They evaluated the amount of plastic waste on the reefs, and visually examined over 124,000 corals for signs of disease. Coral colonies were classified based on whether or not they were in contact with plastic, and as either healthy or affected by one or more of six common diseases. Overall, plastic waste was documented on a third of reefs surveyed, with anywhere from two to 11 pieces of garbage per 100 square meters. Plugging their data into models that account for the range of plastic waste entering the ocean via different coastal populations, the researchers arrived at their estimated 11.1 billion pieces of coral-entangling plastic. This, they note, likely underestimates the scale of the problem, owing to the exclusion of plastic pollution from China and Singapore. Mark Eakin, the coordinator of NOAA’s Coral Reef Watch who collaborates with several of the authors but was uninvolved with this paper, said plastic debris on reefs “has been a major problem for quite some time.” He noted that NOAA has been engaged in cleanup efforts on reefs in northwest Hawaii for years. “This is an area of concern we’ve been familiar with,” he said. “The numbers in this paper are huge,” he said. Eakin, who’s involved with efforts to document the impact of climate change on corals, said he was particularly concerned by the study’s finding that large corals exhibit the greatest disease risk on coming in contact with plastic. These are the same types of corals that tend to survive mass bleaching events triggered by overheated ocean waters. If there’s a silver lining here, it’s that we already know the solutions. We need better waste management systems, particularly in the developing world, and we need to shift our consumption habits away from disposable, non-degradable items. Picking up more of the plastic that’s already out there wouldn’t hurt, either. Cobb added that the burden of dealing with plastic pollution cannot fall solely on the shoulders of the vulnerable communities most reliant on reefs for their livelihoods. We all need to do our part. “Here in America, we have to get serious about our sources of plastic waste...to protect marine ecosystems both at home and abroad,” she said.